App-ID uses as many as four identification techniques to determine the exact identity of applications traversing your network-irrespective of port, protocol, evasive tactic, or SSL encryption. Identifying the application is the very first task performed by App-ID, providing you with the greatest amount of application knowledge and the most flexibility in terms of enabling applications in a secure manner. As the foundational element of our enterprise security platform, App-ID provides visibility and control over applications that can evade detection by masquerading as legitimate traffic, hopping ports or sneaking through the firewall using encryption (SSL and SSH). In the past, unapproved or non-work-related applications on your network left you with two choices-either block everything in the interest of data security, or enable everything in the interest of business. These choices left little room for compromise. App-ID enables you to see the applications on your network and learn how they work, their behavioral characteristics, and their relative risk. When used in conjunction with User-ID™, you can see exactly who is using the application based on their identity, not just an IP address. Armed with this information, your security team can use positive security model rules to allow the applications that enable the business, inspecting or shaping them as needed and leveraging the implicit deny-all-else premise that a firewall is based upon to improve your security posture. Stateful inspection, the basis for most of today's firewalls, was created at a time when applications could be controlled using ports and source/destination IPs. The strict adherence to portbased classification and control methodology is the primary policy element, it is hard-coded into the foundation and cannot be turned off. This means that many of today's applications cannot be identified, much less controlled by the firewall and no amount of "after the fact" traffic classification by firewall helpers can correct the firewall port-based classification. Palo Alto Networks recognized that applications had evolved to where they can easily slip through the firewall and chose to develop App-ID, an innovative firewall traffic classification technique that does not rely on any one single element like port or protocol to determine the result. Instead, App-ID uses multiple mechanisms to determine what the application is, first and foremost, and the application identity then becomes the basis for your firewall policy. App-ID has been created to be highly extensible and as applications continue to evolve, application detection mechanisms can be added to App-ID or updated as a means of keeping pace with the ever-changing application landscape. Traffic is first classified based on the IP address and port. Signatures are then applied to allowed traffic to identify the application based on unique application properties and related transaction characteristics. If App-ID determines that encryption (SSL or SSH) is in use, and a decryption policy is in place, the application is decrypted and application signatures are applied again on the decrypted flow. Decoders for known protocols are then used to apply additional context-based signatures to detect other applications that may be tunneling inside of the protocol (e.g., Yahoo! Instant Messenger used across HTTP). As the applications are identified by App-ID's successive mechanisms, the policy check determines how to treat the applications and associated functions: block them, or allow them and scan for threats, inspect for unauthorized file transfer and data patterns, or shape using QoS. Classifying traffic with App-ID is the first action our firewalls take on traffic, so by default all App-IDs are always enabled. This means you don't need to enable a series of signatures to look for an application you think might be on your network, because App-ID never stops classifying all your traffic across every port - not just a subset of the traffic (e.g., HTTP). App-ID continually monitors the state of an application to see if it changes midstream, provides updated information to your administrator in ACC, and applies the appropriate policy and logs the information. Like all firewalls, Palo Alto Networks next-generation firewalls use positive control, default-deny all traffic, and then allow through only those applications that are within your policy. Everything else is blocked. SSL and SSH Decryption: If App-ID determines that SSL encryption is in use and a decryption policy is in place, the traffic is decrypted and then passed to other identification mechanisms as needed. If no policy is in place, then SSL decryption is not employed. Once the application is identified, and deemed acceptable by policy, threat prevention profiles are applied and the traffic is then delivered to its destination. A similar approach is used with SSH to determine if port forwarding is in use as a means to tunnel traffic over SSH. Such tunneled traffic is identified as ssh-tunnel and can be controlled via security policy. Application and Protocol Decoding: Decoders for known protocols are used to apply additional context-based signatures to detect other applications that may be tunneling inside of the protocol (e.g., Yahoo! Instant Messenger used across HTTP). Decoders validate the traffic conforms to the protocol specification and provide support for NAT traversal and opening dynamic pinholes for applications such as VoIP or FTP. Decoders for popular applications are used to identify the individual functions within the application as well (e.g., webex-file-sharing). In addition to identifying applications, decoders also identify files and other content that should be scanned for threats or sensitive data. Heuristics: In certain cases, evasive applications still cannot be detected even through advanced signature and protocol analysis. In those situations, it is necessary to apply additional heuristic, or behavioral analysis to identify certain applications such as peer-to-peer file-sharing or VoIP applications that use proprietary encryption. Heuristic analysis is used as needed, with the other App-ID techniques discussed here, to provide visibility into applications that might otherwise elude positive identification. The actual heuristics used are specific to an application and include checks based on such things as the packet length, session rate, packet source, etc. With App-ID as the foundational element our enterprise security platform, your security team can regain visibility into, and control over, the applications traversing the network. On a weekly basis, an average of five new applications is added to App-ID, yet nearly every network will have cases where unknown application traffic is detected. There are typically three scenarios where unknown traffic will appear: a commercially available application that does not have an App-ID, an internal, custom application is in use or a threat. Unknown Commercial Applications: Using visibility tools, you can quickly determine if the traffic is a commercial off-the-shelf (COTS) application or not. If it is a COTS application, then you can use the packet capture feature you can then record the traffic and submit it for App-ID development. The new App-ID is developed, tested, then added to the database for all users in the form of a weekly update. Internal or Custom Applications: Next, you can determine if the application is internal or custom; again, using the visibility tools or the log viewer. If the traffic is an internal application, then you can create a custom App-ID using the exposed protocol and application decoders. Once the custom App-ID is developed, your internal application is classified and inspected in the same manner as applications with standard App-IDs. You can enable the internal application via policy, inspect it for threats, shape it using QoS and so on. Custom App-IDs are managed in a separate database on the device, ensuring they are not impacted by the weekly App-ID updates. Custom traffic as a threat: Once the internal or COTS applications have been addressed, the third possible identity of the unknown traffic is that it is a threat. Here too, you can quickly determine the risk levels using the behavioral botnet report or other forensics tools to isolate the characteristics and apply appropriate policy control. Maximize productivity by safely enabling the application itself (Microsoft SharePoint) or individual functions. When a user initiates a WebEx session, the initial connection is an SSL-based communication. With App-ID, the device sees the traffic and the signatures determine that it is using SSL. The decryption engine and protocol decoders are then initiated to decrypt the SSL and detect that it is HTTP traffic. Once the decoder has the HTTP stream, App-ID can apply contextual signatures and detect that the application in use is WebEx. WebEx is then displayed within ACC and can be controlled via a security policy. If the your end-user were to initiate the WebEx Desktop Sharing feature, WebEx undergoes a "mode-shift" to where the session has been altered from a conferencing application to a remote access application. In this scenario, the characteristics of WebEx have changed and App-ID will detect the WebEx Desktop Sharing feature which is then displayed in ACC. At this stage, you will have learned more about the application usage, allowing you to exert policy control over the use of the WebEx Desktop Sharing feature separately from general WebEx use. With App-ID as the foundational element of our firewalls, you can restore visibility and control over the applications traversing your network to the firewall, the most strategic security component in your network security infrastructure. Allowing SharePoint Documents, but blocking the use of SharePoint Administration. Block Facebook-mail, -chat, -posting and -apps, but allow Facebook itself, effectively only allowing users to browse Facebook. Enable the use of MSN, but disable the use of MSN-file transfer and only allow certain file types to be transferred using the file blocking feature. Using an application hierarchy that follows a container and supporting function model, App-ID makes it easy for you to choose which applications to allow, while blocking or controlling functions within the application. The graphic shows SharePoint as the container application, and the individual functions within. There are many cases where you may want to control larger groups of applications in bulk, as opposed to controlling them individually. The two mechanisms that address this policy requirement are dynamic filters and application groups. Dynamic filters: A dynamic filter is a set of applications that is created based on any combination of the filter criteria: category, subcategory, behavioral characteristic, underlying technology and risk factor. Once the desired results for the filter are achieved, a policy that blocks or enables and scans the traffic can be applied. As new App-IDs that fulfill the filter criteria are added in the weekly content updates, the filter is automatically updated as soon as the device is updated, thereby minimizing the administrative effort associated with policy management. The complete list of filter options are shown below. Consumes 1 Mbps or more regularly through normal use. 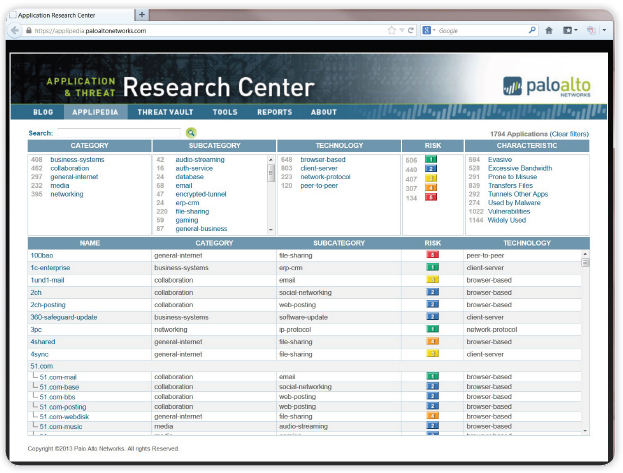 Browse up-to-date application research and analysis at the Palo Alto Networks Application and Threat Research Center. Application groups: A group of applications is a static list of applications may that can be used to enable use for certain users while blocking their use for others. 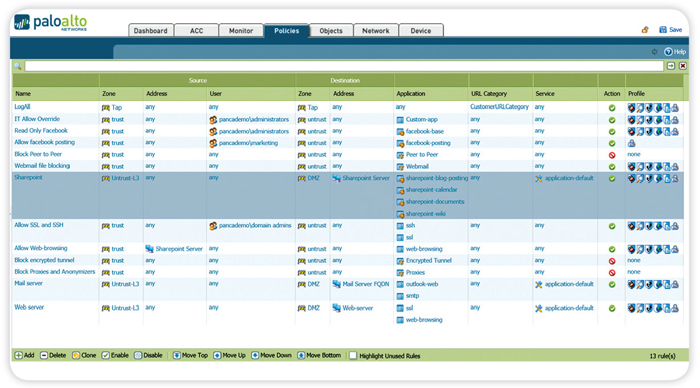 An example may be the use of remote management applications such as RDP, Telnet, and SSH. Each of these applications are known to be used by support and IT personnel, yet employees that fall outside of these groups are also known to use them as a means of accessing their home networks. A group of applications can be created and assigned to IT and support through User-ID, tying the groups to the policy. As new employees are added, they only need to be added to the directory group. No updates are needed to the policy itself. The list of App-IDs is expanded weekly with 3-5 new applications added based on input from customers, partners, and market trends. When you find unidentified applications on your network, you can capture the traffic and then submit the information for App-ID development. Once a new App-ID is developed and tested, it is added to the list as part of the weekly content updates. Download the Palo Alto Networks App-ID Datasheet (PDF).